And now for my next trick.. Hang on, “where’s the jacket? ?” you ask. Well. It’s not Autumn anymore, is it? I took too long in getting started, especially after the comments on the last post regarding busy pattern vs stylelines. Too much dithering! I’ll have it for next year, no worries! Anyways, when the November issue of Burda landed in my sticky little fingers, I bookmarked a few patterns I wanted to make, then bemoaned the fact that all the styles I wanted would mean having to go fabric shopping! Just my luck hu? All the fabric in my stash, and none were right for the patterns I wanted to make. Then I dug a little further (never just look in the first two boxes) and found the blue and ecru flower print viscose I had bought from Tatler’s Fabric in Derby in the beginning of the year. This stuff.. 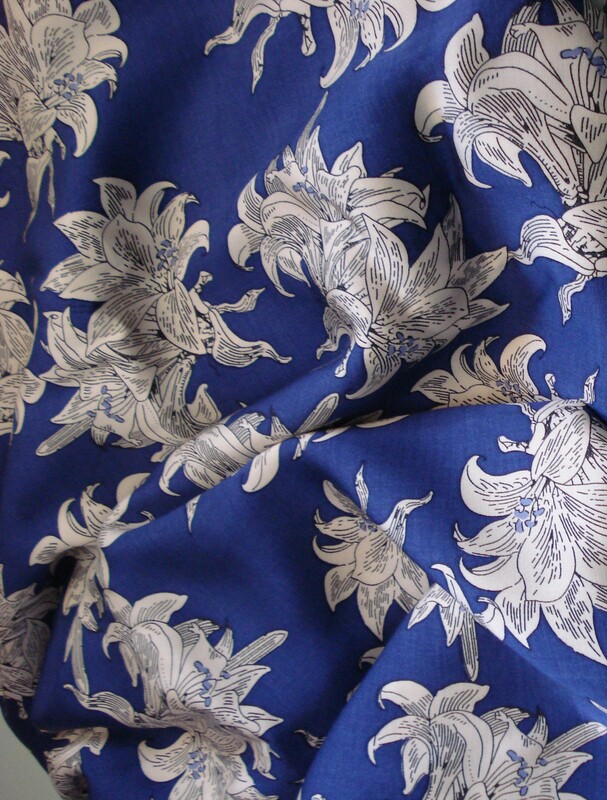 This fabric has the most beautiful drape and handle, and the viscose makes the colours just sing, rather like silk. It’s fabulous! 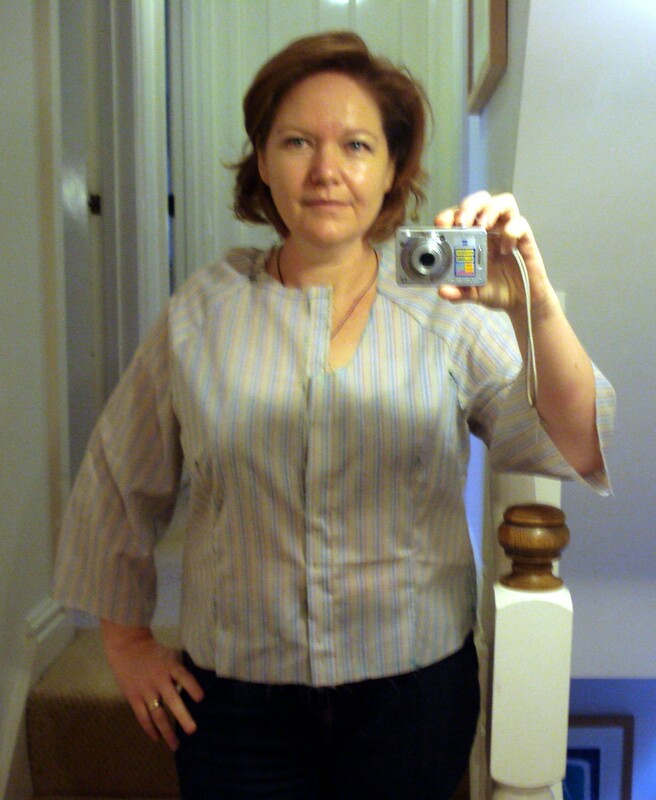 So, fabric in hand, which pattern to start with… I went with this one, (Burda 108 from 11/2012) it has my favourite sleeve detail, 3/4 length with puff and just a teeny binding as the cuff. 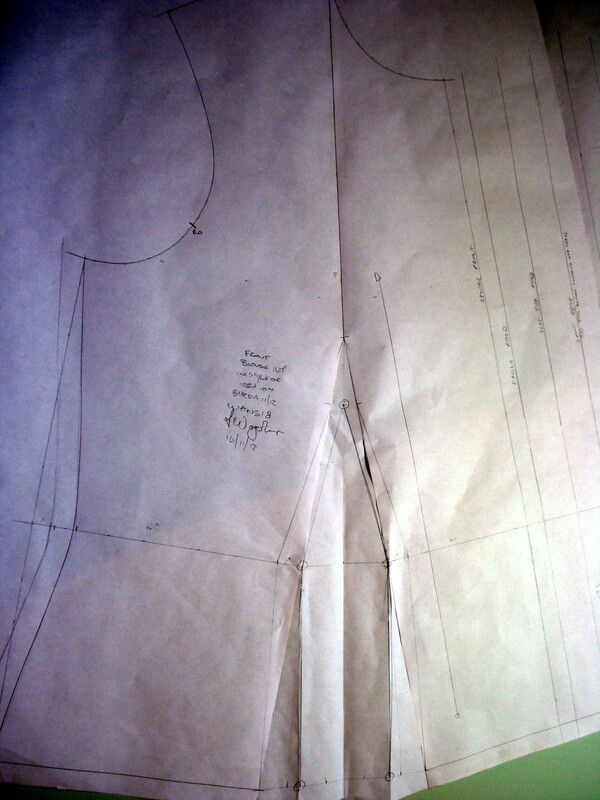 Pattern traced, toile done.. urgh! 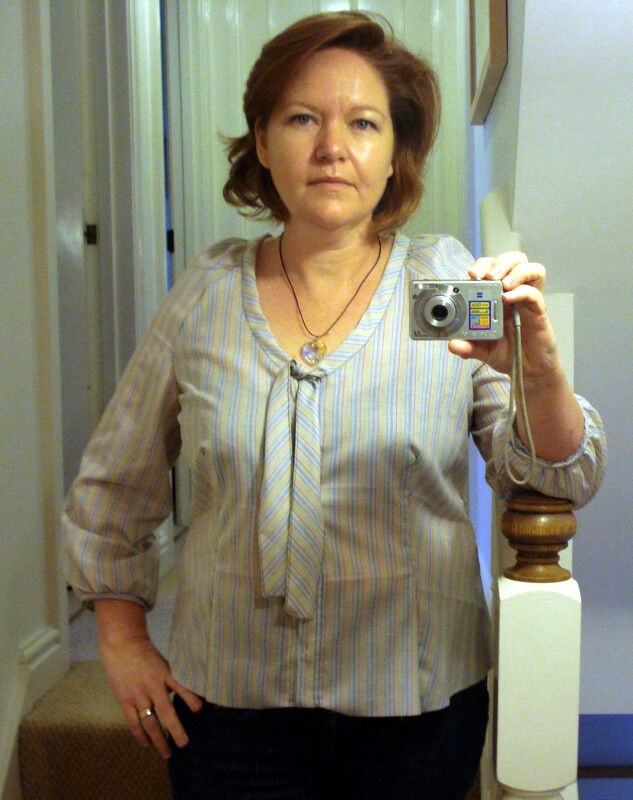 I knew the neckline wouldn’t work on me, I had planned to alter that anyway, but the rest of it… Oh my! I made my usual Burda size, but this was too long, too wide and way too unflattering! This is it after my adjustments – please excuse the fabric, it’s a toile, and this was cheap! 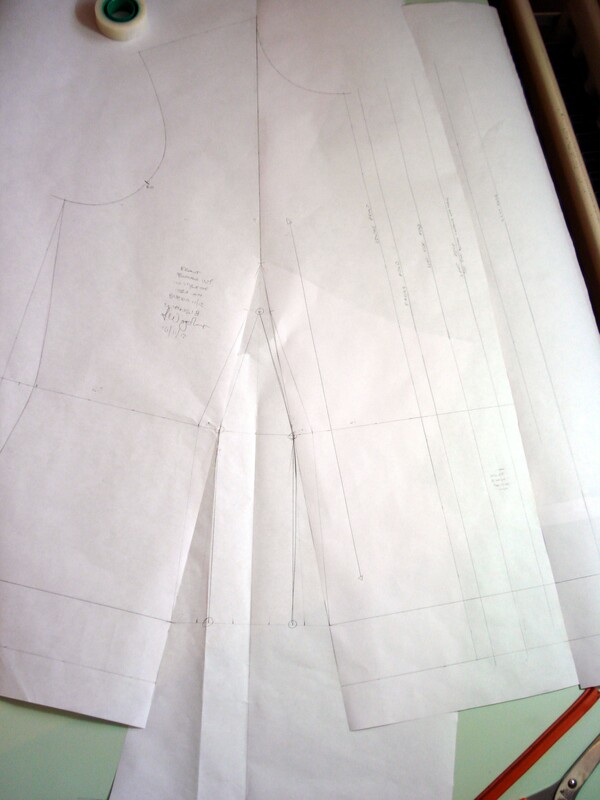 My fiddled with and partly adjusted burda pattern toile. Trust me, it was worse before! I chopped 10cm off the bottom, took in the side seams, made the front dart bigger and made darts in the back to give it some shape. I don’t mind a “casual fit”, but I don’t wear tents! Anyways, by the time I’d done all that and still wasn’t happy I realised my short-cut cheating was no short cut. 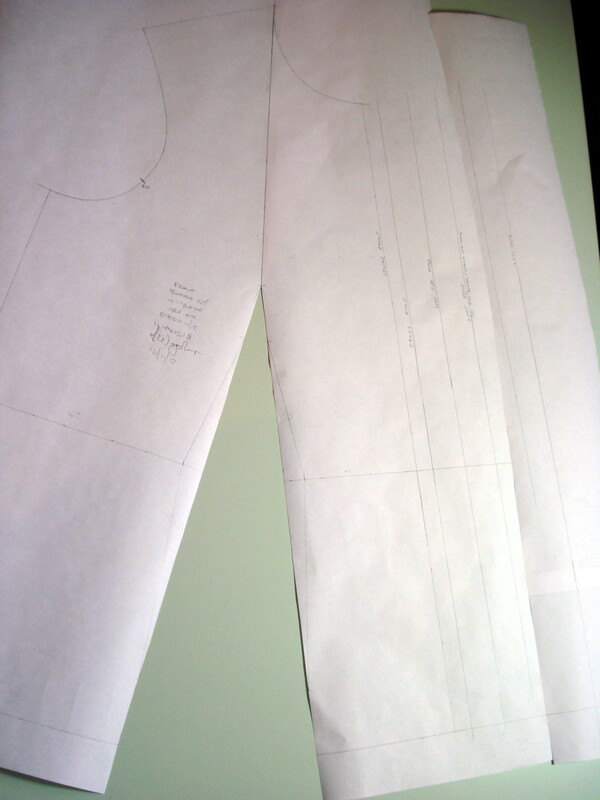 So I got out my pattern cutting stuff and started to make my own pattern. Just goes to show, you have to know what suits you. I photographed the process, but I don’t think my pencil scribblings are going to be the clearest. So here goes, a tutorial if you want to make your own version. 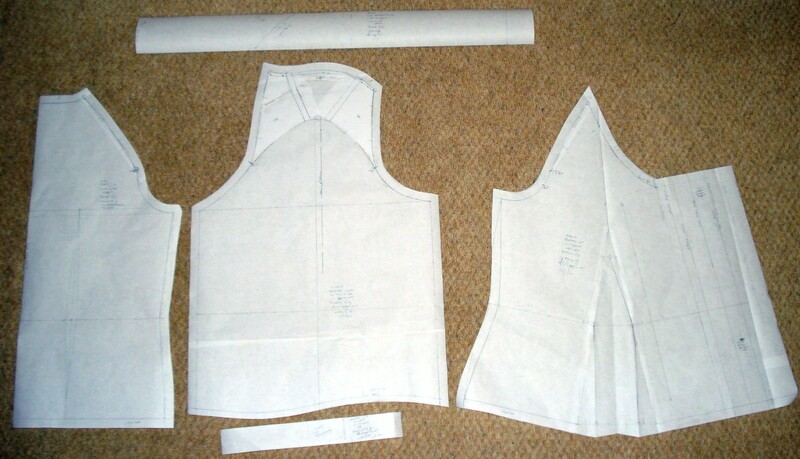 You will need to trace off your close-fitting bodice block and one piece sleeve block. First step is to draw on the buttonstands and facings for the concealed button fly. 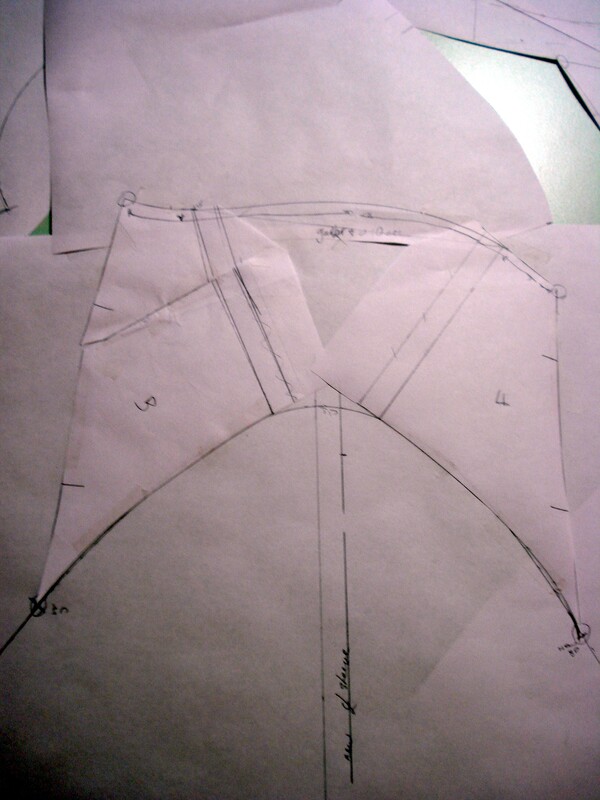 I used the same measurements as the Burda pattern for this part. Then you need to move the shoulder dart into the waist dart and plan the neckline. I wanted a lower neckline than the jewel neck that was on the Burda pattern, and I didn’t want the narrow bias binding either. I thought I’d use the idea of the wider bias “sash and bow” of style 109, but not so wide. 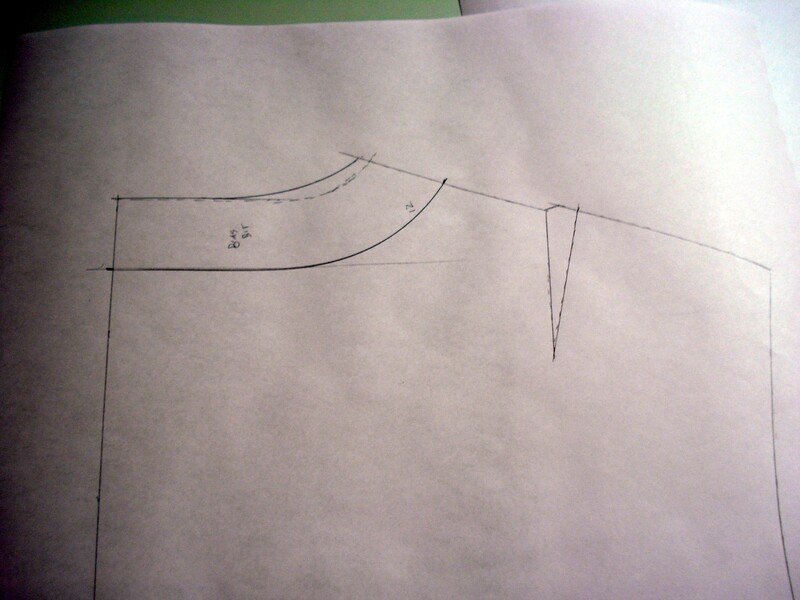 The bias strip I used was 3cm wide, so I planned the neckline to include this. The back is pretty simple for now, this is the 3cm wide strip that will be cut off for the bias binding. Next step is planning the raglan. Draw a line 1cm above the shoulder line on the back. This will be the new shoulder line. Make a mark 3cm down from the neck point along the neckline. On the back, draw a line from this point to the back balance point. On the front, draw a new line 1cm below the original shoulder line. Then make a mark 3cm down from the neckpoint again, and move the front balance point 3cm up the armhole line. Draw a line from the new balance point to the mark you made on the neckline. Make this line, and the one on the back, slightly curved. 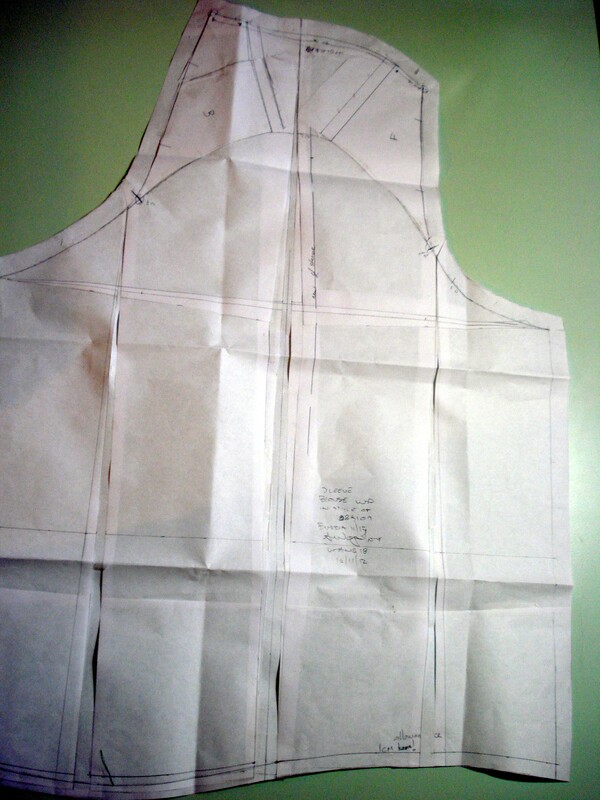 Raglan sleeve, new centre line and front and back parts added. Now for the sleeve. On the sleeve pattern, move the centre line 1cm to the right. 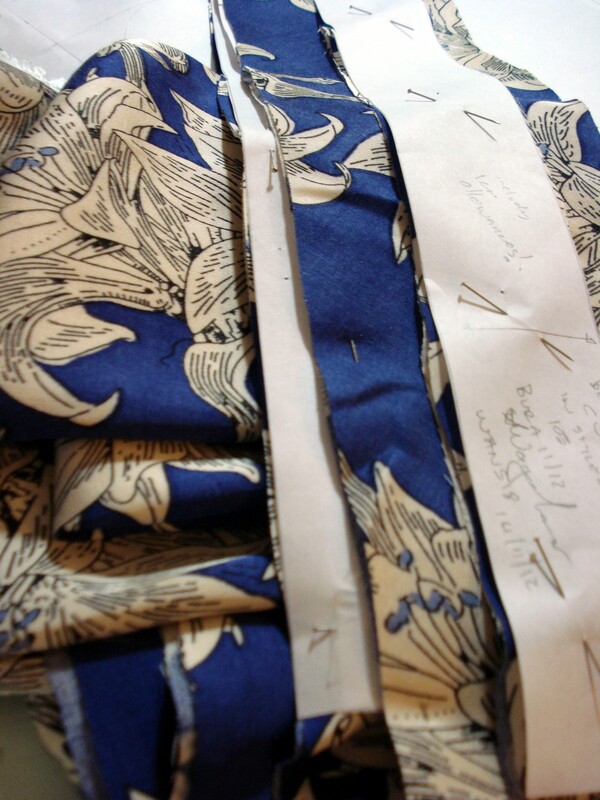 Now cut off the raglan pieces on the Front and Back pattern pieces and lay them onto the top of the sleeve head. 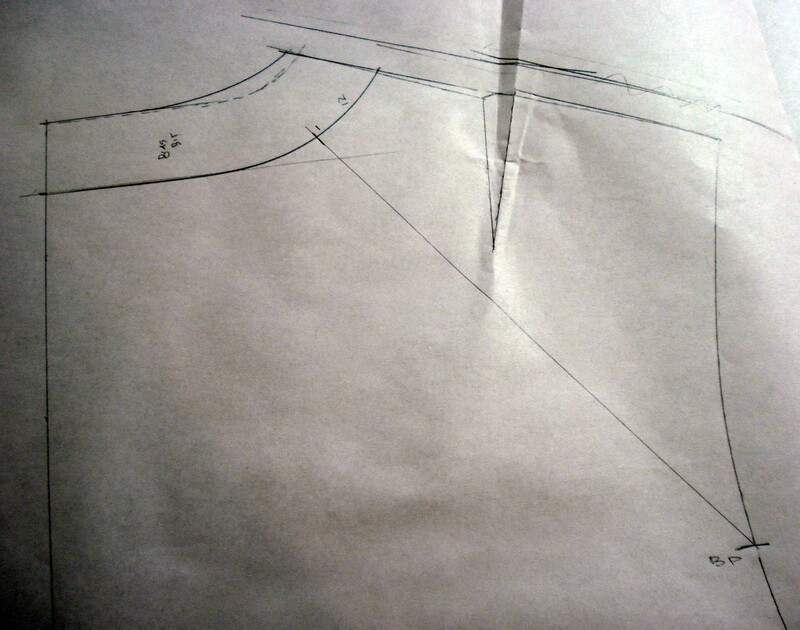 The front and back armhole balance points need to join, and the new shoulder lines must touch the sleeve head. I’m sorry this photo is a little fuzzy. For this design there is no dart at the top of the raglan, the space between the front and back section is gathered. So draw a slightly curved line along the top, joining the front and back. Now divide the underarm line into 4 equal sections and slash and spread to get the width for the ballooning at the sleeve hem. 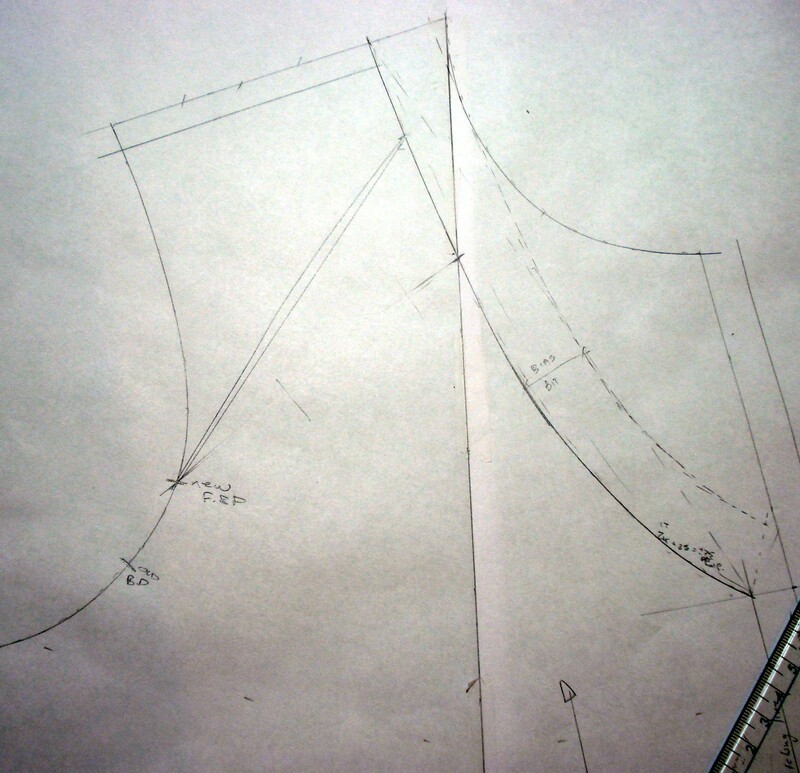 I also dropped the hem line at the back section by 0.75cm. I used 1.5cm at the back, 2cm in the centre and 1cm on the front. I also kept the curved hem shape as the sleeve is finishing below the elbow. I also needed to widen the sleeve at the bicep level. This is a fitting adjustment I do all the time. The cuff for the sleeve stayed much the same, 4cm wide (including allowances) and 33cm long. The necktie was 75cm long, and 8cm wide, including allowances. It could have been longer, but I am happy with the length of the free part. It’s long enough to make a decent floppy bow, and also safe enough that if it comes untied, I won’t end up cutting it, sewing it or stirring it into my soup! I must also add that I used a 1.5cm dart in the back pattern piece to add shaping to the back waist, the side seams had 1.5 shaping on the back and 2.5 on the front. The bodice block is drafted to the hip, about 20cm below the waist. I generally find this is too long for me for shirts, so chopped off 5cm, and then made a curved shirt hem, going up at the sides by 3cm. A shaped hem is so much more flattering than a flat one. The front dart ended up being 6.5cm at the waist and 11 at the hem. This gives a nice straight look the the front, also makes more vertical lines, which help with the slimming effect! Here are all the pieces then. I hadn’t added the fullness to the sleeve, nor had I shaped the hem at this point. I wanted to see how it all looked before doing more fiddling, and the Burda sleeve wasn’t flared, so I wanted to see just how much puff there would be in the sleeve. Sorry, no smiling! I was concentrating on getting the pic in focus with no shaking! I do like it though. It’s all made up now, I’ll get photos out when Daughter No2 gets home from school. May I recommend some listening material? I have in my possession an already much played new release from a South African band, Prime Circle. (Thanks to my brother for special delivery-ing it to me by very fast airmail!) Their 5th album, Evidence has to be their best yet.